The rain started to fall just over a month ago, as Hurricane Harvey began to push its way into Houston, and our community would experience unprecedented historic flooding. Since that time, we have seen our city come together in amazing ways with neighbor helping neighbor, as well as complete strangers working side by side to weather the storm. We have also seen the love of Christ poured out all over our community through the hard work, generous giving, and ongoing prayers by all who have taken part in the relief efforts at Champion Forest Baptist Church. Thank you for your help on behalf of all those who were affected by the storms. 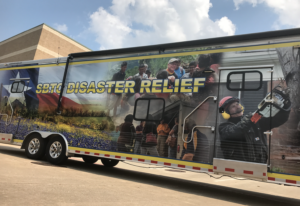 Our relief efforts are continuing at CFBC as the Southern Baptist of Texas Disaster Relief Team continues to mobilize volunteers throughout our city. Since they took over coordinating the work, they have cleared an additional 250 homes, assessed another 335, have 61 projects underway, and have had 49 people accept Jesus as their Lord and Savior! Please know we continue to pray for our community and are willing to serve anyway we can. Champion Forest and friends, you have been incredible these last 6 days. It seems impossible that in just this short amount of time we have already cleared over 400 HOMES, and that’s just the ones we know about. We know many of you completed homes on your own that aren’t in our database. This work requires a relentless attitude and that’s exactly what we’ve seen from you. We sent out over 2,000 unique volunteers this past week and the love you’ve shown to our community will never be forgotten. If you haven’t had a chance to scroll through our Facebook Page (Facebook.com/championforest) you really owe it to yourself to take a look at just a glimpse of what all has been happening. The great news is that we have almost completely exhausted our list of known addresses! That said, Champion Forest, along with our friends, at the SBTC Disaster Relief will continue to work until there’s no homes left to help. Our friends, the professionals at The Southern Baptists of Texas Convention will be coordinating the work from now on. As you know, we have been in full-on sprint mode providing immediate relief to our community. We are now transitioning into a more sustainable pace as we enter into our long-term phase. Each team will be given one house for the assigned time block. We’ve even opened up an evening shift for individuals or groups that want to serve after work/school. You are making a huge difference in our city. Many years from now when we think about Harvey we will certainly remember the storm, but perhaps what will come to mind first is the beautiful way the church rose up and made it their mission to help our neighbors. Thank YOU volunteers for your time, your sweat, and your dedication to make a difference. God bless you. Please return all your tools at the end of each day to the bus barn. Especially the “Blue” tools, we have to return those to the rental company. Due to the devastation of Hurricane Harvey, we’re adjusting various event schedules. We will update this post as more information is available, so please check back. All *Wednesday Activities* (WoW, Meal, Adult Worship, Student Activities, Choir, etc) are back Wednesday at the Champions Campus EXCEPT for Support Groups, which have delayed start 1 week. Debido a la devastación del huracán Harvey, estamos ajustando varios horarios de eventos. Estaremos actualizando esta publicación cuando haya más información disponible. BOTTOM LINE: IF YOU SHOW UP WE WILL GLADLY PUT YOU TO WORK. Thank you to the hundreds of volunteers that have already registered. If you haven’t registered yet, please use the link at the top of this page to register so that we can email you updates and know you served with us. We will go through some basic instructions and the our Mud-Out Team Leaders will organize teams of 6-12 to go out and clean up homes that have been flooded. Let’s roll up our sleeves church. Time to make a huge impact and help hurting people. Champion Forest would like to offer child-care for those members serving on mud-out teams for CFBC. We will provide care for ages 2 thru 5th grade Thursday-Saturday from 8am-3pm as well as Monday (Labor Day) from 8am-3pm. If you are in need of care please register no later than 8:00pm the evening before so we can make sure we have adequate staff. Register directly to Michelle Barr at mbarr@cfbc.org. Es hora de ir a trabajar como la iglesia movilizada y organizada. SI LLEGAS A CHAMPION FOREST QUERIENDO AYUDAR, CON MUCHO GUSTO TE PONDREMOS A SERVIR. Gracias a los cientos de voluntarios que ya se han registrado. Si aún no te has registrado, favor de registrastarte por medio del link en la parte superior de esta página para asi poder enviarte actualizaciones por correo electrónico y saber que has servido con nosotros. Revisaremos algunas instrucciones básicas. Nuestros líderes de Mud-Outs (limpieza de escombros) organizarán equipos de 6-12 para salir y trabajar en casas que han sido inundadas. Es hora de generar un gran impacto y ayudar a la comunidad. Champion Forest quiere ofrecer cuidado de niños a aquellos miembros que sirven en equipos de Mud-Out (limpieza de escombros). Proveeremos cuidado para niños de 2 años de edad hasta 5to grado, de jueves a sábado de 8am-3pm así como el lunes (Labor Day) de 8am-3pm. Si necesitas ayuda, por favor registrate antes de las 8:00pm la noche anterior para asegurar el personal adecuado. Thankfully the water is receding, and we can see light at the end of the tunnel. One of the worst disasters in U.S. history just occurred in our backyard. We know many of you reading this are currently displaced from your homes, and certainly all of us have family and friends that have been devastated by the storm. For those that are discouraged, know that you are not alone and that help is on the way! We have been blown away by the amazing stories that have poured in of the church being the church, helping our neighbors and being used by the Lord wherever God has you planted. Way to go church! PRAY. Do not underestimate the power of prayer or the need for prayer right now. GIVE. CFBC has now set up a Hurricane relief fund that will be 100% used in helping the hurting people in our community affected by the storm. Click HERE and be sure to select the “hurricane” option to contribute to this fund that will help us as we help our city. You can also text “CFBCHURRICANE” to 77977 and a link will be sent to your phone via text message. You cannot get to the church directly from the North. If you live North of Cypresswood you really have to go to 249 via Boudreaux or Spring Cypress. Then take 249 to 1960, and then head up to the church from 1960 via either Stuebner or Champion Forest to Strack. Again, Be SAFE. Do not take any risks. *The church offices will be open very soon. As you can imagine a lot of staff has been affected by the flood as well and are still recovering. All available staff will be now focused on Harvey relief for the foreseeable future. We have been through a terrible storm, but we now have a tremendous opportunity in front of us to be the hands and feet of Jesus, loving the hurting people all over our community. Let’s roll up our sleeves and get to work. We will get through this together, looking to the Lord for guidance every step of the way. See you soon. *Be sure to check the website championforest.org/harvey , as well as Facebook and Twitter for news and updates as they occur. Gracias a Dios el agua está retrocediendo, y podemos comenzar a ver la luz al final del túnel. Nos hemos quedado impresionados por las historias increíbles de la iglesia tomando su papel de IGLESIA, ayudando a vecinos y siendo usados por el Señor dondequiera que Dios te haya plantado. Uno de los peores desastres en la historia de los Estados Unidos ocurrió en nuestra propia ciudad. Sabemos que muchos de ustedes que están leyendo esta nota hoy han sido evacuados de sus hogares, y ciertamente todos tenemos familia o amigos que han sufrido daños devastadores por esta tormenta. ¡Todos aquellos que se sienten desalentados sepan que no están solos y que la ayuda está en camino! Permítanos ayudarle. Pronto lanzaremos un enorme esfuerzo de alivio y queremos ayudarle. Por favor, haga clic aquí y complete el formulario para dejarnos conocer su necesidad. ORAR. No subestime el poder de la oración o la necesidad de oración que hay ahora mismo. DAR. CFBC ha creado un fondo de ayuda a los damnificados por el huracán, que será utilizado al 100% para ayudar a la gente afectada por la tormenta en nuestra comunidad. Haga clic AQUÍ y asegúrese de seleccionar la opción “hurricane”, para contribuir a este fondo y así ayudar a nuestra ciudad. También puede enviar el texto “CFBCHURRICANE” al 77977 y un enlace le será enviado a su teléfono a través de un mensaje de texto. SERVIR. Estos últimos días hemos sido la iglesia dispersa, pero muy pronto seremos la iglesia reunida y organizada, lista para hacer un gran impacto en nuestra comunidad. Necesitamos desesperadamente voluntarios que estén dispuestos a estar en equipos de limpieza de escombros desde cada una de nuestras 4 sedes, listos para servir a aquellos cuyas casas han sido devastadas por la inundación. Necesitamos especialmente a personas con experiencia en la limpieza de escombros, y aquellas que tienen las herramientas necesarias para realizar este trabajo. Solo seleccione aquí: VOLUNTEER y llene el formulario. Este viernes y sábado estaremos realizando un gran esfuerzo para limpiar escombros en nuestra comunidad. Hasta entonces, le animamos a ayudar a sus vecinos, únase con su Grupo de Vida a este esfuerzo, o llegue hasta donde sus familiares y amigos para ofrecerles su ayuda. Nos reuniremos mañana (miércoles) en la sede Champions y en la sede Jersey Village, de 5:30pm a 6:30pm, en un tiempo de oración y adoración con la familia de CFBC. El servicio en la sede Champions será transmitido en nuestra página de CFBC FACEBOOK, mientras el internet esté funcionando. Este servicio será bilingüe. POR FAVOR NO SE DESPLACE HASTA LA IGLESIA A MENOS QUE PUEDA LLEGAR SEGURO. MENOS QUE PUEDA LLEGAR SEGURO. No se puede llegar a la iglesia directamente desde el Norte. Debes venir desde 1960 hasta Stuebner o Champion Forest a Strack. Una vez más, CUIDESE. No se arriesgue. Hemos pasado por una terrible tormenta, pero ahora tenemos una tremenda oportunidad delante de nosotros para ser las manos y los pies de Jesús, amando a la gente herida en toda nuestra comunidad. ¡Vamos unidos a trabajar! Pasaremos por esto juntos, mirando al Señor y buscando Su guía en cada paso. ¡Nos vemos pronto! ONLY COME IF YOU CAN SAFELY MAKE IT. We will gather tomorrow at the Champions campus and the Jersey Village campus for one hour from 5:30-6:30 to just pray, worship, and get up to speed on plan of action. The service at the Champions campus will be streamed on our CFBC FACEBOOK page, as long as internet is working (which it should be). You cannot get to the church directly from North. You must come from 1960 up either Stuebner or Champion Forest to Strack. Again, Be SAFE. Do not take any risks. CFBC will be mobilizing teams to begin the mud-out process for local homes that were flooded during Hurricane Harvey. If your home sustained damage please complete THIS FORM (Click Here) and we will be in contact with you as soon as response teams are available. Note: We have a multitude of requests, please be patient we will respond as soon as possible. Estaremos en contacto con usted tan pronto como los equipos de trabajo estén disponibles. Nota: Proyectamos que tendremos una multitud de peticiones, por favor tenga paciencia, le responderemos lo antes posible. This catastrophe will test us, but we believe through God we can rise to the challenge. Many of you have been asking how you can help. With the size and scope of this disaster, relief efforts will be ongoing for many months. We will begin mobilizing a massive volunteer undertaking of caregivers and mud-out teams soon. Be sure to register to volunteer here so we have your information when we are ready. In the meantime, here are 3 things to do right now. First, PRAY. Let’s lift our eyes to the Lord and ask for mercy and peace. Second, LOVE. We’ve heard countless stories of how you, the church, have risen up and driven boats into neighborhoods, taken in displaced families, and we know that you will continue to do so. We have been so touched by the countless churches and friends from around the country checking on us and getting their people ready to come help as soon as they can. Third, GIVE. CFBC has now set up a Hurricane relief fund that will be 100% used in helping the hurting people in our community affected by the storm. Click HERE and be sure to select the “hurricane” option to contribute to this fund that will help us as we help our city. You can also text CFBCHURRICANE to 77977 and a link will be texted to you. Our Champions Campus is still not out of the woods as the creek continues to rise. It would be an unsafe shelter right now, especially with impassable roads around it. Our Conroe Campus is also not an ideal place for a shelter. Our Jersey Village campus has been and will continue to be used when needed by the Jersey Village Fire and Police Departments as a shelter, when the power is on. Our North Klein Sunday campus (Klein MPC) is now being used as a shelter and will likely be full of displaced families soon. Please check the KLEIN ISD twitter account to see their most recent needs. We do not have the luxury of acting as separate disconnected organizations. We are simply now just Houstonians. We’re proud to partner with Faithbridge as they continue to shelter around 600 people, as well as other School ISDs, churches, and organizations as we tackle this thing TOGETHER. We can do this if we rely on the Lord and help each other. We are reminded of 1 Corinthians 12. We are the body and we need every part to do what God has given us the opportunity to do. Be safe. God bless you. ESPAÑOL: Esta catástrofe nos pondrá a prueba, pero creemos que a través de Dios podemos enfrentar el desafío. Muchos de ustedes han estado preguntando cómo pueden ayudar. Con el tamaño y el alcance de este desastre, los esfuerzos de socorro durarán muchos meses. Pronto comenzaremos a movilizar un equipo masivo de voluntarios. Asegúrese de registrarse para ser voluntario aquí, para que tengamos su información cuando todo esté listo. Mientras tanto, aquí hay 3 cosas que debemos ir haciendo. Primero, OREMOS. Levantemos nuestros ojos al Señor y pidamos misericordia y paz. Segundo, MOSTREMOS AMOR. Hemos oído innumerables historias sobre cómo muchos de nosotros, la iglesia, nos hemos levantado y hemos llevado embarcaciones a barrios, ayudando a familias evacuadas, y sabemos que seguiremos haciéndolo. Hemos sido tan conmovidos por las innumerables iglesias y amigos de todo el país que nos visitan y que preparan a su gente para que nos ayude tan pronto como puedan. Tercero, DEMOS. CFBC ha creado un fondo de ayuda a los damnificados del huracán, que será utilizado al 100% para ayudar a la gente afectada en nuestra comunidad. Haga clic AQUÍ y asegúrese de seleccionar la opción “hurricane” para contribuir a este fondo que ayudará en forma directa a nuestra ciudad. También puede enviar el texto CFBCHURRICANE al 77977 y recibirá el enlace directo para hacer su donación. Nuestra sede Champions todavía no está fuera de riesgo, dado que el arroyo Cypress sigue subiendo. Sería un refugio inseguro en este momento, especialmente con caminos infranqueables a su alrededor. Nuestra sede Conroe tampoco es un lugar ideal para un refugio. Nuestra sede en Jersey Village ha sido y continuará siendo usada como refugio cuando sea necesario por los departamentos de bomberos y policía de Jersey Village. Nuestra sede North Klein los domingos (Klein MPC) ahora está siendo usado como refugio y pronto estará lleno de familias evacuadas. Por favor, consulte la cuenta de Twitter de KLEIN ISD para ver sus necesidades más recientes. No podemos actuar como organizaciones independientes desconectadas. Ahora simplemente somos Houstonianos. Estamos orgullosos de trabajar juntos con la iglesia Faithbridge, ya que continúan recibiendo a unas 600 personas, así como a otros ISDs, iglesias y organizaciones escolares, mientras abordamos esta cosa JUNTOS. Podemos hacer esto si confiamos en el Señor y nos ayudamos unos a otros. Se nos recuerda a 1 Corintios 12. Somos el cuerpo y necesitamos cada parte para hacer lo que Dios nos ha dado la oportunidad de hacer. Cuídese. Dios le bendiga. As the flood continues to devastate our city, it’s been incredible to see everyday heroes jump into action all around our city helping their neighbors. Houston has shown the country how to act during a crisis. Many of you are asking what you can do to help right now. With the roads in the condition they are in, the best thing to for us to do at this point is to continue to help in whatever way you can where God has you planted. Reach out to your family, friends and neighbors, call the Red Cross to volunteer, and pray. Very soon we will begin a coordinated effort mobilizing into the community. Most importantly, please stay safe and do not venture into flooded roads. Stay tuned for more news and info. If you need immediate assistance. please call 911. Here is a list of some helpful links and resources as we navigate the storm. A medida que la inundación continúa devastando nuestra ciudad, ha sido increíble ver a héroes cotidianos tomar acción en nuestra ciudad ayudando a sus vecinos. 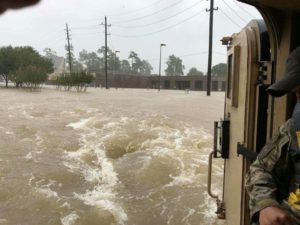 Houston ha mostrado al país cómo actuar durante una crisis. Muchos de ustedes están preguntando qué pueden hacer ahora mismo para ayudar. Con las calles en la condición en la que se encuentran, lo mejor que podemos hacer en este momento es seguir ayudando de cualquier manera que podamos donde Dios nos ha plantado. Comuniquémonos con nuestra familia, amigos y vecinos, llamemos a la Cruz Roja para ofrecernos como voluntarios y oraremos. Muy pronto comenzaremos un esfuerzo coordinado movilizándonos en la comunidad. Lo más importante, por favor, manténgase a salvo y no se aventure en las calles inundadas. Esté atento a noticias y nueva información. Si necesita ayuda inmediata. Por favor llame al 911. Aquí hay una lista de algunos enlaces y recursos útiles, mientras navegamos la tormenta. As our city suffers perhaps the worst flooding event in U.S. history, continue to pray for those experiencing extreme loss as well as first responders as they work around the clock helping those in need. At this point, none of our four campuses have sustained flood damage, praise the Lord. However, we are not out of the woods yet as the waters continue to rise. We are currently in communication with community officials and organizations working on the best strategy to maximize our relief efforts. For now, please stay safe, try to not get out on the roads, and continue to help your neighbors as best you can. As you know, this is an excellent opportunity to be the hands and feet of Jesus wherever God has planted you. We will soon begin rolling out plans on how we as a church can help. Please check back regularly here at championforest.org/harvey for news and updates. Please stay safe. We will see you soon. A medida que nuestra ciudad sufre quizás el peor evento de inundaciones en la historia de los Estados Unidos, continuemos orando por aquellos que experimentan una pérdida extrema, así como por el personal de rescate, mientras trabajan sin descanso ayudando a los necesitados. En este punto, ninguno de nuestros cuatro campus ha sufrido daños por inundación, alabado sea el Señor. Sin embargo, aún no están fuera de peligro pues el nivel de las aguas continúa creciendo. Actualmente estamos en comunicación con funcionarios comunitarios y organizaciones, trabajando en la mejor estrategia para maximizar nuestros esfuerzos de ayuda a la comunidad. Por ahora, por favor manténgase a salvo, trate de no salir a la calle y continúe ayudando a sus vecinos lo mejor que pueda. Como ustedes saben, esta es una excelente oportunidad para ser las manos y los pies de Jesús dondequiera que Dios les ha plantado. Pronto comenzaremos a desarrollar como iglesia los planes sobre cómo podemos ayudar. Por favor, visite regularmente esta página, championforest.org/harvey, para obtener noticias y actualizaciones. Por favor, manténgase a salvo. Continuamos en contacto. We are experiencing heavy rains and severe flooding across the greater Houston area, including the areas around each campus of CFBC. All services and Life Groups are cancelled and the facilities at each campus are closed. Please do not attempt to travel to CFBC as conditions are extremely dangerous. Join us online at 10:00am at Facebook.com/championforest for updates and a time of prayer for our community, our friends and neighbors, and the first responders who are serving in this storm. 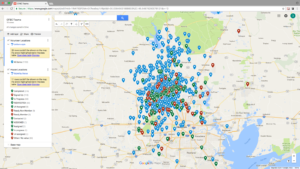 This site was used to keep CFBC members informed and up to date during the aftermath and cleanup of Hurricane Harvey.